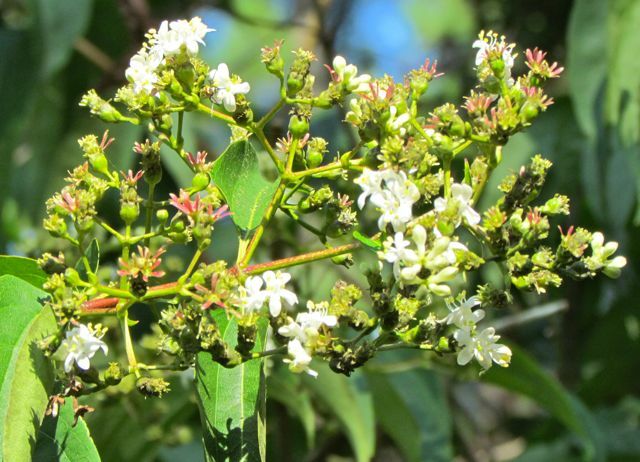 Seven-Son Flower (Heptacodium miconioides) is a native small tree of China. From what I read today, it is rare in China, and actually more common in the United States, thanks to a horticulture industry with an eye for gorgeous plants. The common name derives from the number of white flowers in a cluster (panicle), namely seven. These pure white flowers are small individually, but visually impressive in their clusters, and even more impressive in their fragrance. The sweet perfume of this tree in bloom dominates the humid air common to August mornings in my garden. 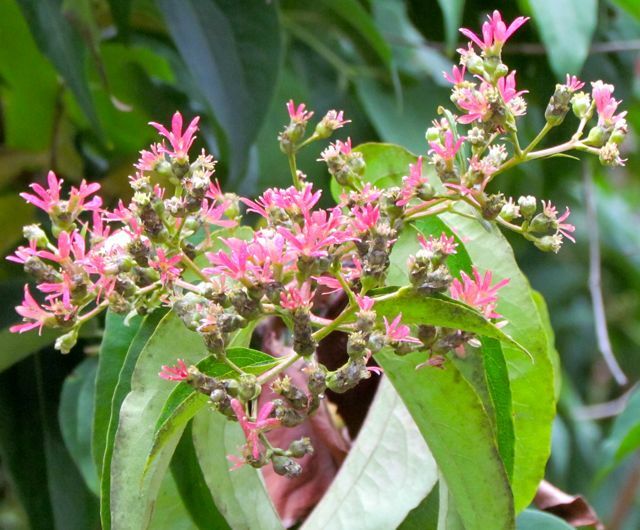 The sepals are actually showier than the white flowers — but without the fragrance. I’m not the only one who thinks the pink clusters look like flowers. The hummingbirds still lingering in my garden test these clusters regularly, convinced that any plant this red should hold tasty nectar. They may find a bit. As you can see, a few white flowers are still mixing in with the sepal display. Heptacodiums are predicted to attain a height of no more than 25 feet in the United States. Mine is about fifteen feet tall, and has been growing for about ten years now. It is perfect for the small-scale landscapes common to houses with minimal yards. I planted mine beside my purple-leaved Loropetalums along my front walk, where it receives much admiration from visitors. The sepals last until hard frost, which in my area is usually late October to early November. That’s what I call a winning landscape plant. But wait — there’s more! I haven’t told you about my favorite part of this tree — its exfoliating bark. I am a sucker for landscape trees with peeling bark. I have quite a collection of different species that display about every permutation of color and peel characteristics that you might imagine. The references I consulted describe the exfoliating bark as gray-brown. That is not how I’d describe the bark on my tree. The exfoliating bark on my Heptacodium is nearly white. It practically glows in the shadows cast by the Loropetalums. Winter is when you get the full effect of this gorgeous bark. 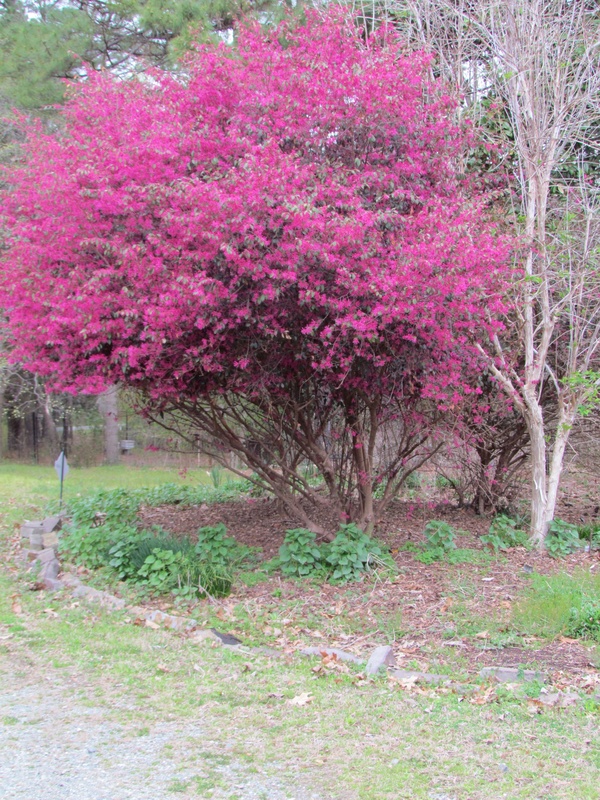 That’s my tree on the right side of this photo that features the blooms of one of the Loropetalums that I wrote about last April. I guess I’d call the color of the bark grayish-white. Whatever color you call it, I think you’ll agree is is eye-catching. The bright green leaves do not turn beautifully in the fall, but I don’t mind, because the mauve sepals persist through most of our fall color season anyway. I call any plant that provides so much visual interest and fragrance a sure-fire landscape winner. If you try one in your yard, I think you’ll agree. This entry was posted on September 14, 2011, 9:44 am and is filed under Favorite Plants, piedmont gardening. You can follow any responses to this entry through RSS 2.0. You can leave a response, or trackback from your own site.